Poipu, Kauai - Setting foot outside the People's Craft Beer Republic of Portland can be a sketchy business. Our beer choices are virtually unlimited. Then you swoop into some foreign land or state and find the pickings mighty slim. Such is the case in much of Hawaii. 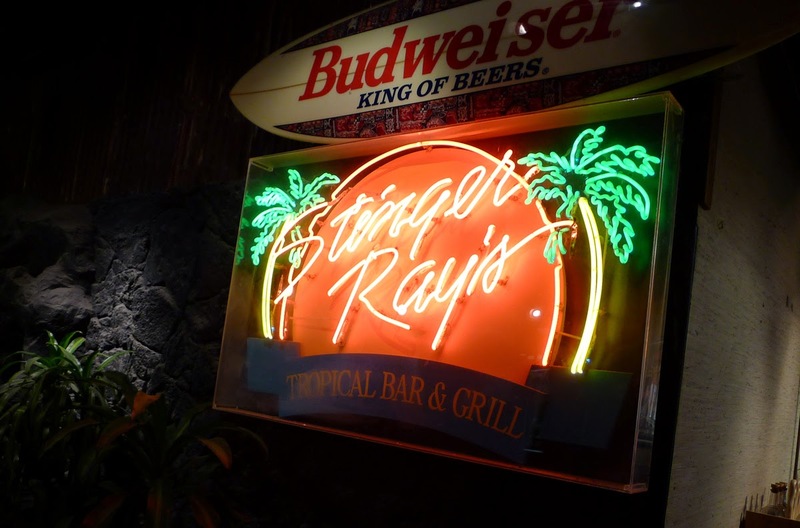 If you want to be blown away by a lousy selection of beer, I suggest Stinger Ray's Tropical Bar and Grill at the Honolulu airport. Honestly, I've been in this place before...many times. I may not have been as picky in those days. A couple of Kona beers might have been enough to appease me. Not now. I realize this is an airport bar mostly full of tourists in transit to outer islands or the mainland. Fine. But the draft list here is abominable. And never mind the prices...highway robbery! 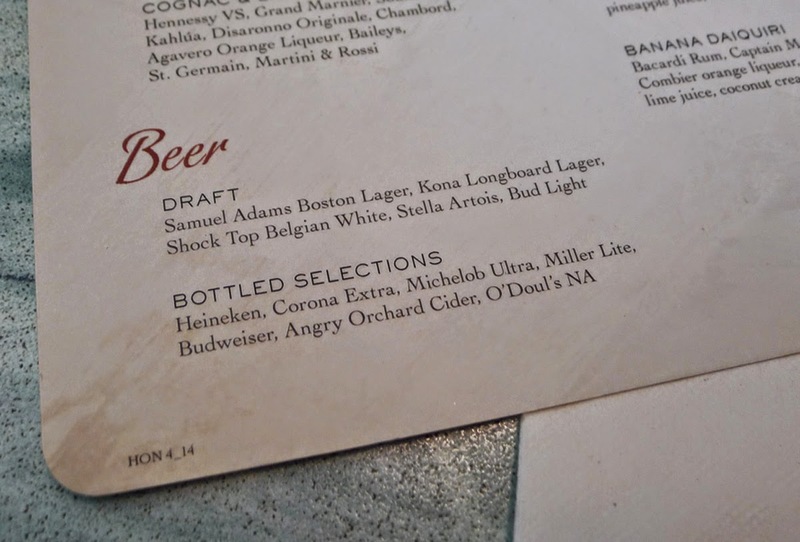 The choices: Shock Top, Boston Lager, Kona Longboard, Goose Island IPA, Stella and Bud Light. Nothing worthwhile in bottles, either. I sucked it up and ordered the Goose IPA. Not terrible...or great. Goose beers started showing up in Hawaii a few trips ago, not long after Anheuser-Busch bought them out. I remember seeing Goose Island handles in a brewpub on Kauai and being astonished. Today, the standard line-up in many island bars is Kona, Goose, Bud, Shock Top, etc. Shabby stuff. There are two major beer distributors in Hawaii...Paradise (MillerCoors) and Anheuser-Busch of Hawaii. Looking at that dreadful Stinger Ray's tap list, it occurred to me that the AB people are winning the tap handle battle. All but Boston Lager are AB brands. 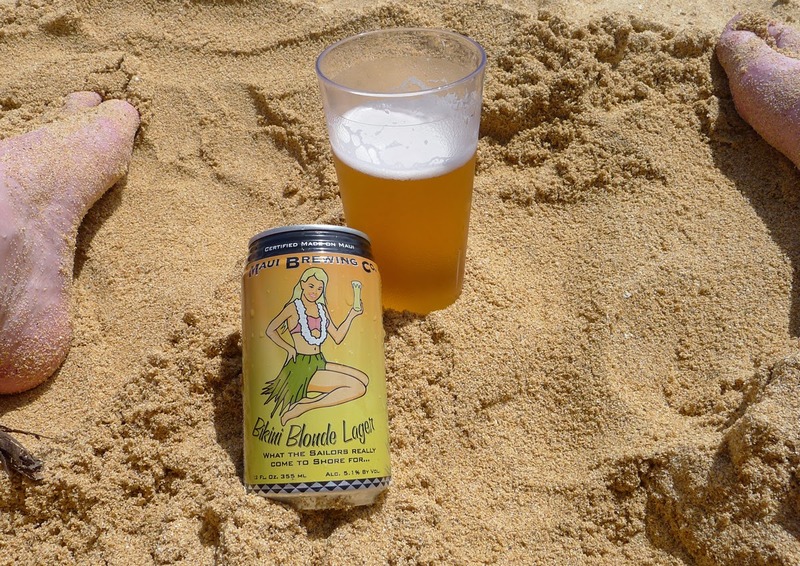 The formation of Maui-Stone Distributing (story here) is altering the craft beer landscape for visitors and residents of Maui, but the timing for the rest of the islands is uncertain for now. 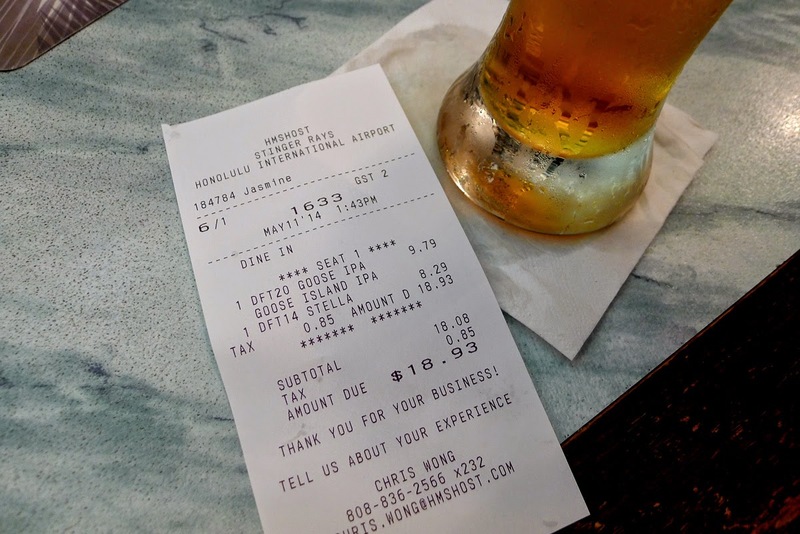 Seeing all that Shock Top and Goose IPA made me briefly wonder if perhaps AB's el-cheapo keg program (mentioned here a few weeks back) might be in play in Hawaii. My sources can't say. I seriously doubt it. AB is losing market share and tap handles like crazy in the Northwest. That's why they introduced the cheap kegs. No reason to do that here...they're doing fine. Speaking of that program, I've heard some rumors of it backfiring. It works like this: AB goes into a bar and gets them to replace a craft handle with Shock Top. Seems like a win. Days later, the rep of the lost handle comes in and gets the bar manager to replace an AB brand (Kona or Widmer are likely suspects) with a full-priced craft brand. Wherever this is happening, AB is effectively trading a profitable handle for a loss leader...not the best financial bargain. The other thing that's apt to happen longterm is brand equity damage to Shock Top and Goose. AB hoped to alleviate this by limiting fire sale discounting to kegs, while packaged pricing didn't change. The problem is, how do you get bars to pay $110 for kegs of Shock Top and Goose Island when they've been paying half that? The answer is, you don't. Or you have a hard time. Oh well. Time to catch some rays and drink a decent beer. Almost 2 decades ago I chased some blonde haole tale on Oahu and wound up living in Kailua, and working for AB in Aiea. I worked for them for about a year as a driver. Lot's of stories there, for a long tall haole. But the short is, AB will do anything that's legal, and not legal if they can get away with it. In Hawaii that was especially true. I hate to make assumptions about business practices...except in the case of Anheuser-Busch, which I consider to be the evilest of empires. They appear to be dominant here. I'm glad to know small brewers can self-distribute...and that the Maui-Stone distribution collaboration will eventually make more craft brands accessible here. Can't happen soon enough. I guess you could call those terrible taplists--but you have to place the comment in historical context. Only 40% of the draft handles are mass market lagers (and only one domestic). We live in a craft world now. Hyperbole is always fun, don't you think? I think it's a horrible tap list. It must be a coincidence that I live in Portland. There is one major distributor if you go by handle count. Paradise has almost 70% of all tap handles in the state, but there are a ton of other distributors selling world class beer. You mentioned Budweiser, or AB Inbev, but there is also Johnson Bros. (The Shelton Bros. portfolio, Iron Fist, and more,) Southern Wine and Spirits (B. United, Clown Shoes, FiftyFifty and more,) Underground Wines (Heretic, Hopping Frog, Knee Deep and more) Flavors of Italy (Wetten Imports, Ironside and more) and that's not even digging into the Paradise Brands like Ballast Point, Green Flash, NoLi, Coronado and more. Maui/Stone will improve all of Hawaii eventually, but it was an odd choice to launch exclusively in Maui. Oahu has world-class beer bars that would rival anything in Portland, SF, San Diego or anywhere really. REAL a gastropub has 300 bottles, 29 drafts, 2 beer engines and has hosted Cantillon Zwanze Day the last two years. Truly one of the best beer bars in the world. BREW'd is the same owner, and although smaller, is just as impressive. Pint+Jigger pours world class beer, even if they are known for having Hawaii's best craft cocktail program. Monkeypod Kitchen, Murphy's, Tropics Tap House and others also have amazing tap lists. I have even seen Ballast Point Victory at Sea on tap in the middle of Waikiki. Maui/Stone will do well, it is just that there are so many bars that are amazing on Oahu they will do much better when they launch there. Just wanted to point out that the Airport and Poipu are a very limited view of the craft beer scene in Hawaii. I didn't even touch on the blossoming craft brewery scene in Hawaii. Forgot about Allied. They bring Bavik, Petrus, etc.